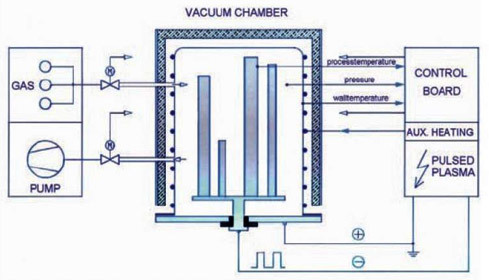 Plasma Ion Nitriding is a process for surface treatment of metal parts to make them resistant to wear and fatigue.Parts to be treated are placed in a vacuum chamber and a high DC voltage (typically around 1000 volts) is established between the parts and the chamber wall. 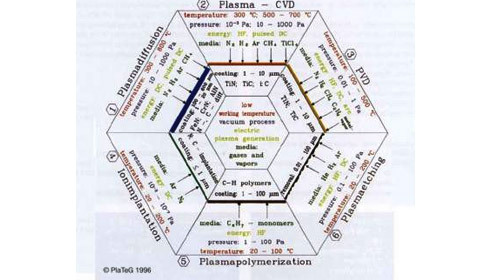 As nitrogen gas is introduced into the chamber, a glow discharge plasma (ionized gas) builds up around the parts. The reactive nitrogen atoms thus bombard the surface, forming a thin layer of hard metal nitrides. Glow discharge that envelopes the entire surface achieves a consistent hardness and case depth. This is specially noticeable on complex geometries where gas nitriding case depths can be non-uniform. Plasma nitriding (H2+N2) least affects the surface finish of the product. Salt bath and gas nitriding, which uses ammonia (NH3) and phosphate for activa- tion , will roughen a ground or polished surface.